Create a hearty dish with our Rustic Honey Mustard-Chicken Grilled Cheese! 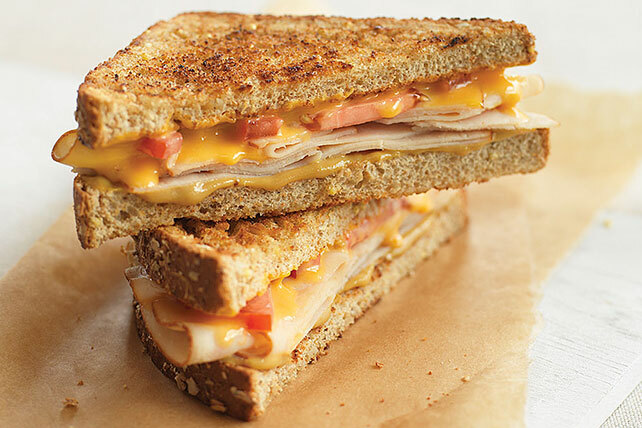 Nutty multi-grain bread adds flavor and texture to this chicken grilled cheese. Spread 1 bread slice with mustard; fill bread slices with all remaining ingredients except butter. Serve with an ice-cold glass of fat-free milk and a mixed green salad to round out the meal. Substitute thinly sliced red or green pepper for the tomato.